AFAM Aluminium Rear sprockets - For an optimal weight reduction. AFAM Aluminum Sprockets for optimal weight reduction. Aluminum AFAM sprockets are CNC machined in aluminum 7075 T6 and also have the unique AFAM tooth profile. Weight saving sprockets for Racing. AFAM Motocross Aluminum Sprockets (N in the reference) silver anodized and shaped in the second generation snowflake design for weight savings. This is the all-round aluminum AFAM sprocket for Off Road use. AFAM Motocross Aluminum Self-cleaning Sprockets (+ in the reference) have been hard anodized. This is a harder layer which reduces wear. The color is Gun Metal and the bottom of the teeth is on both sides provided with a mud groove to evacuate sand and mud quickly in order to avoid chain tension. With its 3D relief design, they are milled for maximum weight savings, but they still remain safe. The proper tolerances for off-road usage and the AFAM tooth profile makes it a high quality product with a long service life. 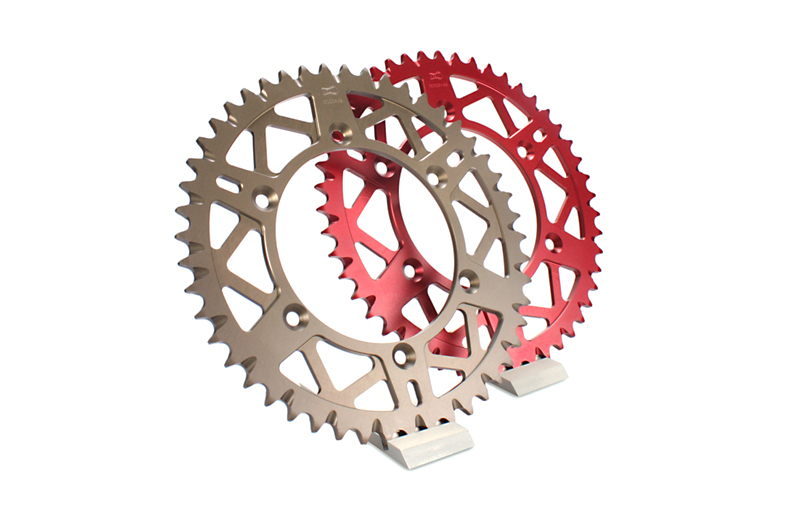 These MX sprockets are also available color anodized. AFAM Racing Aluminum Sprockets (- in the reference) also have these harder surface obtained by hard anodizing. Most of these sprockets exist in the original pitch, but also in a conversion model for a narrower chain. These AFAM sprockets have custom tolerances for race use and a weight-saving design to ensure the most efficient transmission.